We’re in the depths of a Brooklyn winter. 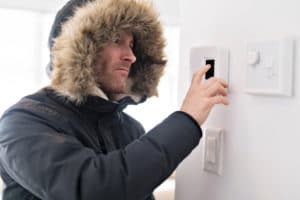 The last thing you want is to come home to a cold house after a long day at work, but sometimes wear and tear take their toll on your home heating system. While some problems, including lack of maintenance, clogged filters, faulty thermostats, and leaky ductwork, are pretty universal, each type of heating system has some unique issues that can lead to a needed repair. No matter what you’re running, Petri Plumbing is right around the corner to fix it and get your home toasty warm again. Here are some of the most common heating system problems. Boilers are one of the oldest types of heating systems. While regular maintenance can keep your boiler operational, if it’s more than 10 years old, it could be as much as 50 percent less efficient than a newer model. Our service experts can help you decide whether it’s best repair or replace your boiler. If you’re still using heating oil, it might be time to switch to natural gas. As always, if your boiler or furnace uses natural gas, be alert to the signs of leaks. If you smell the rotten-egg odor of natural gas, leave your home immediately and call 911 and your gas company. Once your home is safe, your neighbors at Petri Plumbing can check your system and get you back up and running. If you are having trouble with your heating system or suspect it needs repair, just call us at (718) 748-1254.